Who has not dreamt of visiting or living in the Caribbean? The world is full of beautiful places, but there is no doubt that this part of the world is one of the most enticing ones. For many people who have vacationed in the Caribbean, the desire to stay there for longer periods of time often comes up. 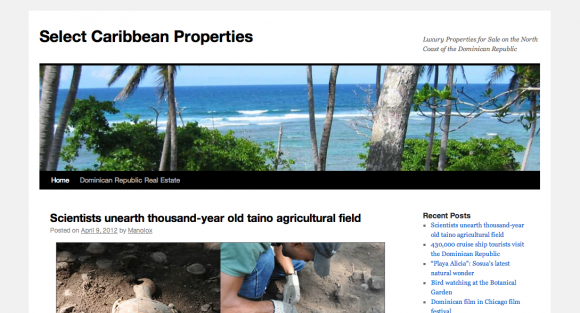 If you are one of these people, you might want to pay this site a visit: Select Caribbean Properties’ Blog. This is a Dominican Republic real estate blog, where you can find all sorts of information about the area. You can read about the state of the country, as well as news and updates that are relevant to prospective property owners. On top of that, you can read about events and other information such as historic places, activities, and tourism news. If you are looking at making the Caribbean a second home (or maybe your permanent home), this blog will be a useful source of information.